When it comes to a fat loss diet, getting control of your appetite can go a long way. No, you shouldn’t starve yourself. And you want to make sure to stay far away from any pill that claims to help control your hunger. 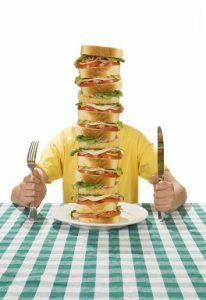 Appetite control is all about understanding the difference between physiological and psychological hunger cues. Physiological hunger is your gut telling you it’s time to eat. Even though you’re trying to lose weight, you shouldn’t starve yourself. Eating to ensure that your metabolism is still functioning optimally is key to a healthy and lean physique. Psychological hunger is a bit different. This is more about our reaction to food and can even come from boredom. Maybe you just ate 30 minutes ago but a co-worker brings in pizza – the scents might go to work trying convince you that you need to eat again. This also occurs when some jerk waves a fresh doughnut right in front of your face and insists you take a bite. Distinguishing between the two takes a lot of practice, but one way that you can deal with your appetite in a healthy manner is to use a “pre-load.” Preloads involve taking in some form of light calories prior to eating a meal. A glass of water could be considered a pre-load, but you could also use a grapefruit or a small bowl of broccoli. Researchers used pre-loads to help subjects lose weight. Subjects were divided into three groups: one drank grapefruit juice prior to eating, while another group actually ate grapefruit. The last group simply ingested water prior to eating a meal. Subjects did this for 12 weeks; at the end of the study, they had decreased their calories by around 20% per day. Along with that, they also managed to drop their weight by 7% (1). There was no difference between the juice, fruit, and water, but researchers noticed that those who took in the grapefruit had an improvement in their blood work. What’s cool about this study is that no one really complained about hunger. It’s possible that the water and grapefruit (even though most of the grapefruit is in fact water) simply filled up stomach volume and made the subjects feel fuller. The same could be said for the small amount of fiber in the grapefruit. People were able to lose weight without without the misery of feeling empty and unsatisfied. The point of the study though is that you can deal with your appetite in a sensible and healthy way. Avoid weird gimmicks and expensive pills; trust me, I’ve worked with enough people to know that they don’t work in the long run. You can use water, green tea, or a small serving of vegetables prior to eating a meal. As I always tell my clients, small things lead to big changes – so enjoy the weight loss.